Ah Spring, when the food trucks are in bloom. 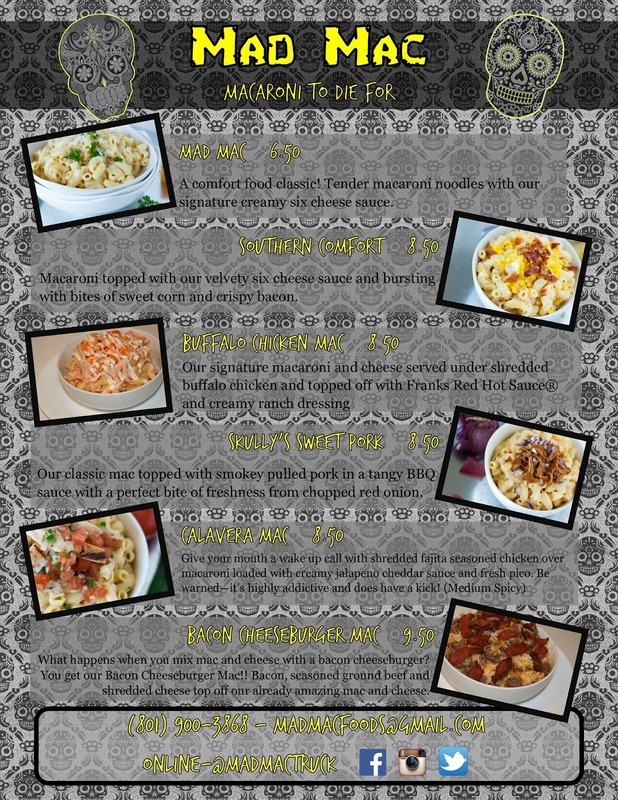 The Southern Idaho Food Truck Feast is still going strong on Wednesdays and Thursdays. 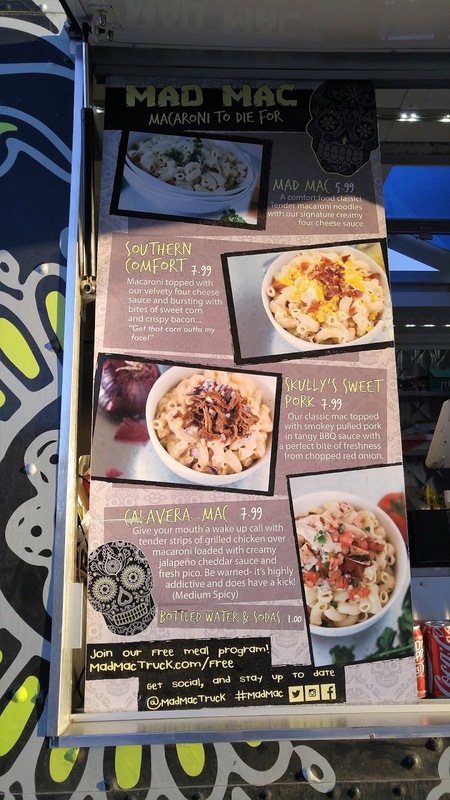 The Idaho Food Truck Coalition is becoming a great source to keep track of which trucks are where on any given day, as well as arranging for a gathering of vendors at Ann Morrison Park on Thursdays. And the old reliable Food Truck Rally peeps are having their first two events of the year this month on the 15th and 29th. 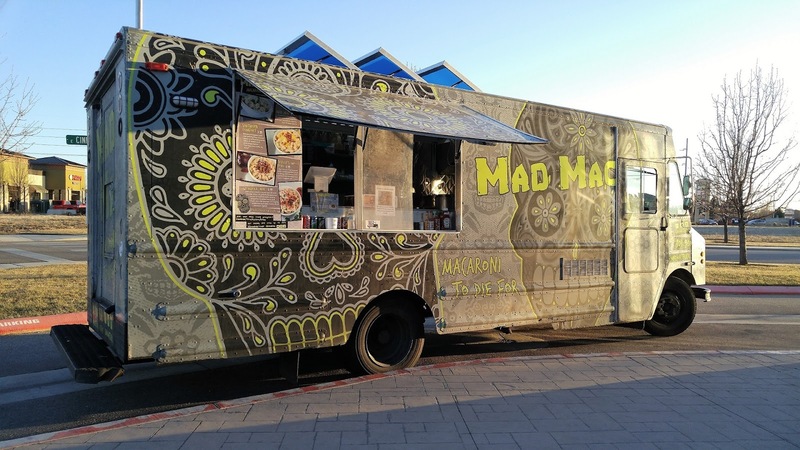 While we have lost a few trucks and had a few others who have evolved into brick and mortar locations, others are popping up to take their places. One of the newbies, Mad Mac, transplanted here from Utah at the beginning of the year. As you might expect from the name, they specialize in macaroni and cheese concoctions. And since they're one of the regular trucks on Slanted Rock's rotation, they're in my neck of the woods fairly often, and I took advantage of a particularly nice day a few weeks back to check them out. Now I like mac and cheese (hell, who doesn't? ), but there are as many bad ones out there as there are good ones, so I approached with a kind of cautious optimism. I had scoped out their menu on Facebook before going, so I knew I was getting a six cheese sauce and my choice of toppings. So suffice it to say I was a little bit surprised when the menu on the side of the truck said the sauce consisted of four cheeses. Oh well. The prices were about fifty cents lower than on their Facebook menu as well, so I figured maybe they had streamlined their sauce and passed a little of the savings on to the customer. I was picking up dinner for myself, my mother, and my brother. 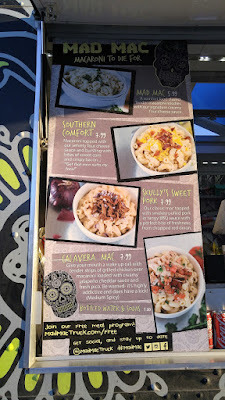 The latter, an unrepentant hot sauce addict, picked the Buffalo Chicken Mac, while Mom and I both chose the Hot Dog Mac and Cheese (so said the Facebook page, the flyer on the truck called it German Sausage Mac). Since all this stuff is pretty much ready to go, you just have to wait a few minutes while it's finished and assembled. The super friendly guy who took my order said that my brother was a lucky guy, because they were at the end of the Buffalo Mac supplies for the night and they just gave him everything that was left. I was passed a bag of takeout containers, and headed for home. Hideous, I know. I'm sorry. But you can see they weren't lying. 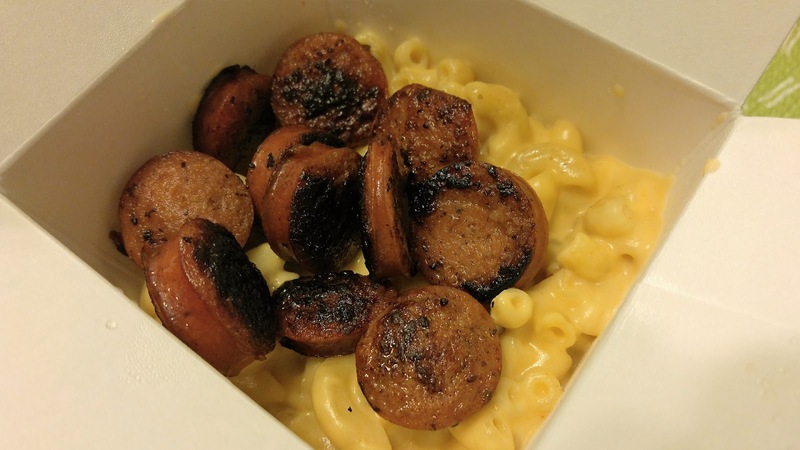 They crammed that box near to overflowing, mostly with the toppings, which is why you can't see any macaroni. What you CAN see is shredded chicken, with copious amounts of Frank's Red Hot and ranch. I would have preferred bleu cheese, but it's nowhere near as popular as ranch, and besides that I wasn't the one eating it. My brother was a happy camper, but he's not as picky as I. Plus, you wouldn't believe how often he douses his food with Frank's. He buys it in the big plastic jugs. But I digress. What about my food? ...it just doesn't have a lot of flavor. I've had a lot of mild-flavored mac and cheese in my time, usually as a side dish with barbecue or something. And as a side dish, it's fine. It's a classic comfort food. But when it's the main event, and at these prices, and with that many cheeses involved, I just expected more of a flavor punch. Then there's the texture. 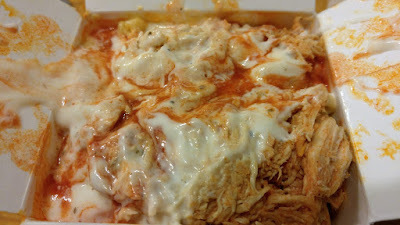 It was creamy, yes, but I disagree with the menu description of the sauce as "velvety". I've come across this texture in a fair amount of restaurant mac and cheese, and I guess the best way to describe it is gritty, or maybe grainy. I guess it doesn't bother a lot of people, because like I said I've run across it many times before, but personally I just don't dig it. On the occasions where homemade mac and cheese has turned out that way, I've tossed it. There's a lot of talk about this issue on cooking forums. It's blamed on processed cheese, pre-shredded cheese, inferior quality cheese, overheating the sauce, adding the cheese to the roux at the wrong time...whatever it is, I personally can't help but see it as a flaw. I hate writing disparaging reviews. I would be perfectly happy if every place I went was amazing, though I don't know how much credibility I would have if that were the case. I don't think of myself as particularly snobby, although my standards have probably raised some since I started this blog. And I wish these guys all the best. They were very friendly and obviously proud of what they're doing. But honestly, if I'm craving mac and cheese as an entrée in the future, I'll be more likely to end up at Noodles & Company where the same money gets me twice the food (both pasta and protein) and no grit.